Because the major search engines provide information at a worldwide level, it is often not easy to get an inventory of local skills or "near-to-you" competence. Initiated by Agoria and implemented at CETIC, Illico Presto is a search engine focused on Walloon innovation and technologies. Because the major search engines provide information at a worldwide level, it is often not easy to get an inventory of local skills or "near-to-you" competence. As an example, who exactly knows the leading domains of expertise developed in our Walloon research centers ? However, that kind of information is of great importance for your future partnerships. Restricted to an infinite part of the World Wide Web, Illico Presto takes that situation as an advantage compared to any other web search engine. Indeed, the search engine is able to provide "up-to-date" and complete results thanks to its daily refreshed index and a deep crawling of the target web sites. 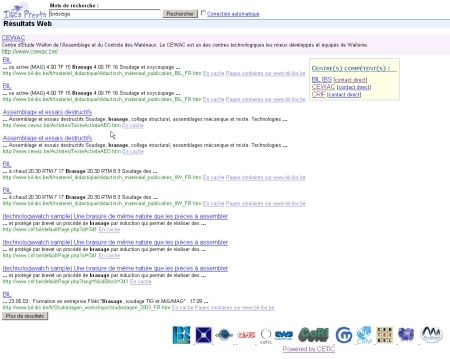 For instance, queries on specific terms such as "brasage" or "électroérosion" provides much more results in Illico Presto than by the way of Google.